As American workers approach their retirement age, they often wonder what to expect in terms of monthly Social Security benefits. Your benefit amount is directly impacted by your lifetime earnings, upon which Social Security taxes were collected to support benefit payments during retirement. To get an estimate of your monthly benefit, you can visit https://www.ssa.gov/benefits/retirement/estimator.html to use the Social Security Administration’s Retirement Estimator tool. The methodology for calculating a monthly Social Security benefit amount can be difficult to understand, so we’ll explore the formula here. Americans earn Social Security benefits by paying Social Security taxes. Those taxes amount to 6.2% of your income with an upper limit on the total amount taxed – that limit is $128,400 in 2018. Additionally, employers match your payment, meaning that a total amount equal to 12.4% of your earnings are contributed to Social Security. The more you earn over your lifetime, the higher your monthly benefit payment during retirement – the Social Security Administration has calculated the amount you’ve contributed during your years of work and associated this amount with your Social Security Number, so when you go to draw on this amount, they can easily calculate your benefit. But how is that benefit calculated? The challenge the SSA deals with is that inflation changes the value of the dollar relative to the wage paid at the time the work was done to what that wage would earn today – whether you’re a plumber, waiter, banker, truck driver, or engineer, your wage is almost certainly much higher in 2018 than it would have been in 1978. That’s not because those jobs have become more lucrative, but because wages increase across the board in step with normal economic inflation and a general increase in the standard of living over that period. To account for this, the SSA calculates what’s called your average indexed monthly earnings (AIME) to account for changes in average wages since your Social Security taxes were collected. The AIME is based on the 35 years in which you earned the most. How can I estimate my Social Security Benefits? To calculate your AIME, and in turn, your monthly Social Security retirement benefit (called “primary insurance amount” or PIA), the SSA provides a spreadsheet with instructions that will allow you to get an estimate. However, when you start drawing your benefits, the SSA will do this calculation for you to determine the amount you receive. First, you’ll compile all your income by year, and multiply them by the SSA’s index factors for calculating the indexed earnings. Using the indexed earnings numbers, you’ll choose the 35 years that you earned the most and add them up. Divide the result by 420, which is the number of months in 35 years. This gives you your AIME –an average of your monthly earnings over your lifetime, adjusted for inflation and standard of living increases. Multiply the first $895 of your AIME by 90%, the amount over $895 and less than or equal to $5397 by 32%, and the remainder by 15%. Add this up and round the sum down to the nearest dollar to calculate your PIA. Your PIA is figured based on a retirement age of 66 years and 4 months. Are there any other factors that can affect my Social Security benefit amount? > If you choose to retire and start collecting benefits early, your monthly benefit amount will be less based on spreading the payments over a longer retirement period. > You can also delay retirement and collection of benefits until after your full retirement age (66 years and 4 months) until you reach age 70, increasing your benefit amount accordingly. > If you are still working but decide to collect Social Security benefits, your benefit amount will be different. > If you are a government worker with a pension, a different formula is used for your benefits. > Cost-of-living increases may be added to your benefit beginning with the year you reach 62, which will affect your future benefit amount. > If you are receiving benefits as a spouse, child, or survivor, a different calculation applies. I’m not yet close to retirement age – what should I be thinking about at this stage? Considering that your income will directly impact your Social Security retirement benefits, the earlier you start thinking about your retirement, the better. You should choose an occupation that will support you and your family’s lifestyle both before and after retirement. Let’s look at where these thresholds fall in terms of annual income – remember, $128,400 is the max for Social Security purposes. Using 2018’s numbers as a baseline, everyone making $10,740 a year or less will receive 90% of that amount in their monthly Social Security benefits based on their PIA. However, the next $54,024 only earns a benefit of 32%, and the next $62,326 after that earns a benefit of 15% in Social Security retirement. This creates a stair-step effect of benefit amounts based on your income level during your earning years. How would this play out based on some average yearly incomes for common occupations? Note that the chart below assumes 35 years of work at this mean income level supplied by the BLS for the occupation in May 2017 (the latest report available). Your choice of career will certainly affect your Social Security retirement. The earlier you can think about your career path, the better. If there is one key differentiator between baby boomers and their parents, it is the higher incidence of divorce. Americans over 50 are twice as likely to be divorced compared to the same age group 20 years ago. Your ex-spouse must be at least age 62. If the divorce occurred more than two years prior, your ex-spouse does not need to have filed for his or her own retirement benefit. Example: Michael and Maria were married over 10 years. They have been divorced over two years. Both are age 62. Maria has not remarried. Maria is eligible for a divorced-spouse benefit based on Michael’s work record, regardless of whether or not Michael has filed for his benefit. If you claim your divorced-spouse benefit at full retirement age or later (66 for baby boomers born between 1943 and 1954), your benefit will be 50% of your ex-spouse’s primary insurance amount (PIA). The primary insurance amount is the amount your ex-spouse will receive if he claims his benefit at full retirement age. Example: Jim and Judy are divorced. Jim’s PIA is $2,400. Judy files for her divorced-spouse benefit at age 66. She will receive 50% of Jim’s PIA, or $1,200, as her divorced-spouse benefit. What if you also qualify for Social Security on your own work record? If you also worked and qualify for a Social Security benefit based on your own work record, you may be able to coordinate your divorced-spouse benefit with your own retirement benefit in order to maximize each type of benefit. But you must get the timing right. Don’t file at 62. If you file for Social Security at age 62, you may not be able to receive a divorced-spouse benefit. That’s because you will be required to take your own reduced benefit first. If your PIA is more than one half of your ex-spouse’s PIA, you will not ever be able to receive a divorced-spouse benefit. Example: Sam and Sue are divorced after being married more than 10 years. Sam’s PIA is $2,400. Sue’s PIA is $2,200. If Sue files for Social Security at 62, she will be forced to receive her own reduced benefit of $1,650 (75% of $2,200). Since her PIA is more than one-half of Sam’s PIA, she will not ever be able to receive a divorced spouse benefit. The $1,650 will be her permanent benefit e xcept for annual cost-of-living adjustments. File a restricted application at FRA. To receive a divorced-spouse benefit while your own benefit builds delayed credits – an ideal strategy for divorced people – you can file a restricted application for your divorced spouse benefit at full retirement age and switch to your own maximum retirement benefit at age 70. Example: If Sue, from the above example, waits until age 66 to file a restricted application for her divorced-spouse benefit, she can receive 50% of Sam’s PIA, or $1,200 from age 66 to 70. At age 70, she can switch to her own maximum retirement benefit of $2,904 ($2,200 x 1.32). This is Sue’s optimal Social Security claiming strategy, allowing her to maximize both benefits and giving her the highest lifetime benefits. Note: The Budget Act of 2015 is phasing out the ability to file a restricted application. You must have attained age 62 by January 1, 2016 to file a restricted application for spousal benefits. If you are not able to file a restricted application, you may still be eligible to receive a divorced-spouse benefit, but only if it is higher than your own benefit. To file for a divorced-spouse benefit, you need not be in contact with your ex-spouse. Your ex-spouse’s current marital status is not relevant. In fact, if your ex-spouse has remarried, the current spouse and any other ex spouses can also receive benefits without affecting your divorced-spouse benefit. Or, if your ex-spouse has not remarried, he (or she) can claim a divorced-spouse benefit off your record. Unlike with spousal benefits, two divorced spouses can each claim a spousal benefit off the other’s record at the same time. If you are not in contact with your ex-spouse, it may be difficult to estimate the amount of your divorced-spouse benefit. Due to privacy issues, the Social Security Administration will not give out this information until you are ready to apply for the benefit. You can generally ballpark your ex-spouse’s PIA at somewhere between $2,000 and $2,600. Your divorced spouse benefit will be 50% of that amount if you file for it at your full retirement age. To file for your divorced-spouse benefit, you will need to make an appointment with your local Social Security office and show a certified copy of the divorce decree. It is helpful to have your ex-spouse’s Social Security number (you can get it off an old tax return), but not essential. If you do not have your divorce papers you can order a certified copy through VitalChek, www.vitalchek. com. If your marriage lasted right around ten years and you’re not sure if you meet the ten-year requirement, check the date on the divorce decree; some people are surprised to learn that the actual date of dissolution is later than they had thought. If your ex-spouse has died, and if you were married at least ten years, you may qualify for a divorced-spouse survivor benefit. If you apply for it at your full retirement age or later, the benefit amount will be 100% of his PIA, or, if he had already started benefits, the amount your ex-spouse was receiving at the time of death. As with divorced-spouse benefits, you can sequence the timing of the survivor benefit and your own retirement benefit to maximize each benefit. For example, you could apply for a reduced divorced-spouse survivor benefit as early as age 60 (50 if disabled) and then switch to your own maximum retirement benefit at age 70. Or you might do it the other way: start your own reduced retirement benefit at age 62 and switch to your maximum survivor benefit at full retirement age. Your financial advisor can help you determine the optimal strategy. If you were married two (or three) times and each marriage lasted more than ten years, you can choose which ex-spouse’s record to draw from. In fact, you can sequence these benefits for maximum advantage, essentially taking advantage of several benefits, just not at the same time. It can get complicated. Your advisor and SSA can help you sort it all out. Keep in mind that divorced-spouse benefits must stop upon remarriage. You cannot receive a divorced spouse benefit if you are married (one exception: the divorced-spouse benefit may continue if the person you marry is receiving survivor benefits at the time of the remarriage). But also consider the potential spousal benefit from your new spouse. If you are receiving a divorced-spouse benefit at the time of your remarriage, that benefit would stop but you may immediately start receiving a spousal benefit based on your new spouse’s earnings record without waiting the usual one year for spousal benefits. So here you might want to compare the two benefits and either remarry or remain single depending on which benefit is higher. If your ex-spouse is deceased, divorced-spouse survivor benefits would not be available to you if you remarry before age 60. Or, to put it another way, if you remarry after age 60, you may still receive a divorced-spouse survivor benefit based on the earnings record of your ex-spouse who has died. The bottom line: if you are eligible for divorced-spouse benefits or divorced-spouse survivor benefits and are thinking of remarrying, consider delaying the marriage. If your ex is still alive (and has a higher PIA than your new potential spouse), remarriage at age 70 will allow you to receive full divorced-spouse benefits from age 66 to 70, when you would switch to your own maximum retirement benefit. If your ex is deceased, you can remarry anytime after age 60 without jeopardizing your divorced-spouse survivor benefit. Talk to the Social Security Administration and to your financial advisor about the best claiming strategy for you based on your personal circumstances. As director of retirement and life planning for Horsesmouth, Elaine Floyd helps advisors better serve their clients by understanding the practical and technical aspects of retirement income planning. A former wirehouse broker, she earned her CFP designation in 1986. IMPORTANT NOTICE This reprint is provided exclusively for use by the licensee, including for client education, and is subject to applicable copyright laws. Unauthorized use, reproduction or distribution of this material is a violation of federal law and punishable by civil and criminal penalty. This material is furnished “as is” without warranty of any kind. Its accuracy and completeness is not guaranteed and all warranties expressed or implied are hereby excluded. Most people tend to underestimate their life expectancy. But thinking you might live to a very old age might lead to better planning decisions. Life expectancy is a critical element in Social Security planning. Because benefits continue for life, the total amount you stand to receive over your lifetime hinges on how long you and your spouse live. In fact, we could add a new strategy for maximizing Social Security benefits — to live a really, really long time. Nothing maximizes total Social Security benefits more than extreme longevity. If a 62-year-old person with a primary insurance amount (PIA) of $2,000 starts Social Security now, he will receive a total of $411,130 if he lives to age 80, versus $1,048,270 if he lives to 100, assuming 2% annual cost-of-living adjustments. He can more than double his take by living an extra 20 years. If he waits until age 70 to start Social Security, he’ll receive $451,680 by age 80, or $1,573,047 by age 100, or nearly three times the earlier-death amount. This is in contrast to other retirement resources which diminish as the years go by. Life expectancy has increased dramatically in recent years, but people’s thinking hasn’t kept up with it. Most people think they will live to be around 80, according to the Society of Actuaries. This thinking probably comes from a combination of what people understand about average life expectancies and how long their grandparents lived. But there is some evidence that you – yes, you — could be among those who will end up maximizing Social Security benefits through extreme longevity. A new book titled The Longevity Project: Surprising Discoveries for Health and Long Life from the Landmark Eight-Decade Study has discovered that the key to a healthy, long life is not doing specific things such as exercising or eating vegetables, but rather living a conscientious life. This means being prudent, persistent, and well organized – the same traits that would lead a person to plan for retirement and seek the services of a financial advisor. So I would urge you not to buy into the statistical averages when choosing a life expectancy for retirement planning purposes. Rather, envision yourself in extreme old age. What if you just keep waking up in the morning? What if you get to be 90, 95, 100, 105? As you know, delaying the onset of benefits is the very best way to maximize Social Security in the event of extreme longevity. It means forgoing a few years of benefits in your 60s, but you’ll make it up on the other end. So when planning your retirement, consider the value of Social Security over a very long lifetime, just in case you — or your spouse — makes it that long. Wondering how to maximize your Social Security benefits? Here are three options almost anyone can do. Not so long ago, baby boomers viewed Social Security as a retirement program for old folks. High-earning boomers felt that Social Security didn’t apply to them because the monthly checks were small and they believed the system wouldn’t be around when they retired. Now the tide has shifted. Nearly all boomers have embraced Social Security, and they’re on a mission to get the most out of the system. Maximizing Social Security has become a national obsession, even—especially—among high-earners. A boomer who has earned the Social Security maximum throughout his career and who turns full retirement age (66) in 2016 will receive a monthly benefit of approximately $2,700. If he plays his cards right, he could receive even more. One of the most frequently asked questions by boomers is: “How can I increase my Social Security benefit?” There are three ways to do it. The easiest way to increase your Social Security benefit is to do nothing. In 1975 Congress authorized the automatic cost-of-living adjustment (COLA) based on the annual increase in the CPI-W from the third quarter of one year to the third quarter of the following year. The annual COLA is applied beginning with December benefits, which are payable in January. Most of the news reports that come out each year when the COLA is announced talk about the high cost of living and whether the COLA increase is enough for seniors on fixed incomes. What is not so well publicized is how the COLA can impact a person’s Social Security benefit over time. The higher the benefit, the higher the COLA increase will be. Let’s take someone with a roughly average benefit of $1,300. If we apply a 2.7% COLA to this benefit (2.7% is the number used in the Social Security Trustees’ intermediate projections) then the benefit goes up to $1,335, a $35 dollar increase. A maximum earner with a PIA of $2,700 would get a benefit increase of $73 ($2,700 x 0.027 = $73). If that same maximum earner were to delay his benefit to age 70, he’d get an increase of $96 ($2,700 x 1.32 x 0.027 = $96). These may not seem like large amounts, but if you multiply them out and compound them over many years, they add up. This brings us to the second way you can increase your Social Security benefit. Many about-to-retire boomers ask how their benefit will be affected if they continue to work or, conversely, if they retire early. Social Security’s primary insurance amount (PIA) is based on an average of the highest 35 years of earnings. If you don’t have 35 years of earnings, your total earnings will still be divided by 35 years to come up with the average. Working longer will allow you to replace those years of zero earnings with positive earnings and bring up the average. If you already have 35 years of earnings, you can still improve your earnings record if you earn enough to cause an earlier, lower year of earnings to drop off. How will these higher earnings affect your Social Security benefit? Let’s use the example of a person born in 1954 who started working in 1976 and earned the Social Security maximum all his life. When he turns 62 in 2016, his PIA is calculated to be approximately $2,700. This is based on earnings from 1981 through 2015. What if he decides to work an extra year and earns the Social Security maximum of $118,500 in 2016? Now the 1981 indexed earnings of $100,232 will drop off and be replaced by the 2016 earnings of $118,500. His earnings record will now include the years 1982 through 2016 and raise his average indexed monthly earnings, raising his PIA by about $10 dollars. What if he works another year at maximum earnings? His PIA will go up another few dollars. Incidentally, if his earnings in 2016 had been less than they had been in 1981, it would not cause his PIA to go down. Once the PIA has been calculated at age 62, higher earnings may cause it to go up, but low earnings will not cause it to go down. $2 you earn over $15,720 in 2016. Again, we’re talking small amounts, but they grow larger when you multiply them out and apply COLAs and delayed retirement credits. This brings us to the third way to increase a Social Security benefit. Most boomers are aware of the rules that provide for a reduced benefit if they apply at 62 and a higher benefit if they file at 70. Indeed, the amounts are shown right on the annual Social Security statement. But the difference between the age-62 amount and the age-70 amount doesn’t seem very large at first glance, especially when the carrot of immediate free money is dangling in your face. But if you project those benefits out over a lifetime, incorporating annual COLAs, and even additional earnings—understanding that if the primary breadwinner in your family dies, his higher benefit will continue as long as the surviving spouse is alive—the difference between applying at 62 and applying at 70 expands enormously. Let’s take the case of the maximum earner who turns 62 in 2016. The PIA formula shows his PIA to be about $2,700. If he were to take his benefit this year, he would receive 75% of $2,700, or $2,025 per month. If he waits until 66, he’ll receive the full $2,700. And if he delays to age 70, the benefit will increase by 8% annual delayed credits between 66 and 70, giving him a benefit of 132% of $2,700, or $3,564. Adding up all the monthly benefits, by age 90, he will have received a total of $704,700 if he files at 62, or $898,128 if he files at 70. If he doesn’t make it to 90, his surviving spouse will continue to receive his benefit as her survivor benefit. These amounts do not include COLAs or additional earnings. And that’s without COLAs and delayed retirement credits. When we factor in estimated 2% cost-of- living adjustments and 8% annual DRCs from ages 66 through 70, we get an age-70 benefit of $4,439. This will boost his cumulative benefits by age 90 to $1,373,336 and his widow’s monthly income to $6,596—compared with $1,334,098 and $6,407, respectively, if he had claimed at 70 but stopped working at 62. So, if you are a 62-year-old maximum earner and you want to get the absolute maximum Social Security benefit, you might: (1) keep working at maximum salary to age 70, and (2) claim your Social Security benefit at age 70. This will give you a benefit of $4,439 per month at age 70, compared with a benefit of $2,450 at age 70 if you retired and claimed benefits at 62 (this is the $2,091 early filing benefit plus eight years of 2% COLAs). By age 90, this maximization strategy will give you cumulative benefits of $1,373,336 vs. $973,375 if you claim at 62, and monthly income of $6,596 vs.$3,640. Obviously, these show the extremes, from stopping work and claiming benefits at 62 to stopping work and claiming benefits at 70. In real life, the stop- work age and the claim-benefits age could be different. You might stop working at 62 and file for benefits at 70. This would give you more benefits than if you had filed at 62, but less than if you had kept working until age 70. Social Security strategies must naturally be integrated into your overall retirement plan. 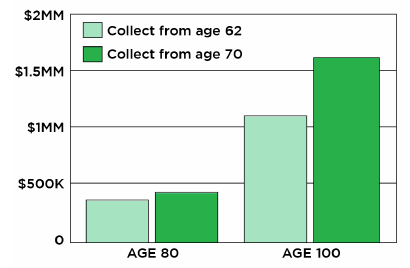 But if you’re looking to get the most out of the system, remember this: Work till 70, claim at 70. Furthermore, these amounts also do not include taxes. Most retirees will pay income taxes on 85% of their benefits. But we’re talking here about how to get the most dollars out of the system. Since the government never takes 100% of our money, boomers who maximize Social Security benefits will end up ahead, even after paying the necessary taxes. What if You Have Already Filed? How can you increase your benefit if you have already filed for Social Security? The answer is simple: Keep working. If it’s been less than 12 months since you filed, you can withdraw your application and repay benefits and start over later. If it has been more than 12 months since you’ve filed, or if you don’t want to go to the trouble of withdrawing and repaying, you can simply go to work at a high enough salary that all of your benefits will be withheld (roughly $60,000 or more). When you turn full retirement age, the benefit will be recomputed to add back in the actuarial reduction for those months in which a benefit was withheld. At this time you can voluntarily suspend your benefit to earn the 8% annual delayed credits on the amount of the benefit at the time of suspension. There have been cases where a client filed for Social Security at 62, received just one or two checks, and then went back to work. Because the benefit will be suspended—automatically from 62 to 66 and voluntarily from 66 to 70—they will end up with nearly the same benefit as if they had initially waited until age 70 to file. There may be more ways to increase your Social Security income if you also qualify for spousal benefits, divorced-spouse benefits, or survivor benefits. For customized help, visit a financial advisor who has the calculation tools necessary to analyze Social Security claiming strategies that consider your individual situation. How much money do you need to retire? What rate of return on your investments do you need to achieve your “nest egg”? Decide the annual income you’ll need for your retirement years. It may be wise to estimate on the high end for this number. Generally speaking, it’s reasonable to assume you’ll need about 80% of your current annual salary in order to maintain your standard of living. Add up the current market value of all your savings and investments. Estimate the value of your social security benefits. U.S. residents can obtain their estimated benefits at the Social Security Administration (SSA) website. Before we begin with our sample calculation, a word on inflation. When drawing up your retirement plan, it’s simplest to express all your numbers in today’s dollars. John will need $80,000 of annual retirement income – in today’s dollars (i.e., not adjusted for inflation). John currently has $400,000 in savings and investments. Visiting the SSA website, we can quickly calculate John’s estimated social security benefits in today’s dollars. Assuming John is born 45 years ago and will retire 20 years from now, we can retrieve his estimated social security benefits in today’s dollars. The SSA website gives us a value of around $2,300 per month. 1. Based on 80% of his annual earnings. Now, John determined he would need $80,000 (in today’s dollars) annually to live during his retirement years. To the nearest $100, this works out to about $6,700 per month. Assuming John’s social security funds come through as estimated, we can subtract his estimated monthly benefits from his required monthly income amount. This leaves him with $4,400 per month that he must fund on his own ($6,700 – $2,300 = $4,400), or $52,800 per year. John is in good health and has a family history of longevity. He also wants to make sure he can pass along a sizable portion of wealth to his children. As a result, John wants to establish a nest egg large enough to enable him to live off of its investment income – and not eat into his principal amount – during his retirement years. Assuming John will be able to grow his investments to $750,000 (1) by the time he retires he will need a dividend yield of just a fraction above 7% to obtain the $52,800 he will need annually. Seven percent might be possible if dividends increase 3.5%/yr for 20 years. Without any investment appreciation or dividend income, $750,000 would last 14.2 years if drawing out $52,800/year. This illustrates the importance of monitoring your investment growth rate (3.2%) and the dividend growth rate (3.5%) of your individual holdings or total portfolio. 6.7% total return is not easy to come by today without a great deal of volatility. If John doesn’t invest any more money for the 20 years of retirement, his $400K will grow to $750K by dint of a 3.2% annual return. With the demise of guaranteed pensions, and in light of the risks you face in managing your own retirement assets, maximizing Social Security becomes a critical part of retirement planning. One of the most important decisions a retiree faces is when to apply for Social Security benefits. This is not a decision to be made lightly; the lifetime, inflation-adjusted income promised by Social Security makes it one of a retiree’s most significant assets. If you were to calculate the present value of the Social Security income stream, it would rival or exceed the lump sum many people have in their 401(k) plans at retirement. Serious investors work hard to maximize the value of their IRAs and 401(k) plans, often not realizing that their Social Security “asset” can be maximized as well. Pre-retirees can enhance its value by building a strong earnings record and applying for benefits at the optimal time. Let’s say you have a primary insurance amount (PIA) of $2,500. This is the amount of monthly income you will receive if you apply for Social Security at your full retirement age. Full retirement age is 66 for baby boomers born between 1943 and 1954. Let’s also say you have a life expectancy of 86. This is slightly longer than the average life expectancy, but there’s a good chance you or your surviving spouse will live at least that long. If you apply for Social Security at 62, your benefit will be reduced to account for those four extra years of checks. If your PIA is $2,500, your permanent benefit would be $1,875, which is 75% of $2,500. If you apply for benefits at 70, your benefit will get a boost of four years of 8% annual delayed credits, giving you a permanent benefit of $3,300 a month. Now let’s see what the lifetime value of your Social Security income stream would be depending on when you start your benefit. Source: SSA, author’s calculations. Not adjusted for inflation. The key to maximizing your Social Security “asset” is to understand the lifetime value of the income stream. If you are looking at your Social Security statement, you may be tempted to take $1,875 per month at 62 rather than waiting until age 70 to receive $3,300 per month. But if you consider the lifetime value of your benefits, assuming a realistic life expectancy, you can see that claiming the higher benefit at 70 will give you more total benefits over your lifetime. Just as you seek to maximize the value of your IRA and 401(k), you can also maximize the value of your Social Security. You can do this by locking in your highest benefit by claiming it at age 70. When the combined benefits for a married couple are taken into consideration, the analysis becomes more complex. You must take into account each spouse’s age, their combined life expectancies, the benefit based on each spouse’s own earnings record, the spousal benefit for each spouse, and the amount the surviving spouse would receive after one spouse dies. If the higher earning spouse dies first, the lower earning spouse will jump up to that higher benefit. If the higher earning spouse had maximized his benefit by claiming it at 70, this will give the widow more income. This is why we nearly always recommend that the higher earning spouse claim his benefit at 70. This will maximize his retirement benefit while he is alive and the survivor benefit for the widow after his death. But everyone’s situation is different. That’s why it is important to get a customized analysis of your claiming options and to understand both your potential monthly income as well as the amount of Social Security you stand to receive over your lifetime based on your claiming age. Copyright © 2016 by Horsesmouth, LLC. All Rights Reserved. What is a Fee-Only Financial Advisor vs. a Fee Based Financial Advisor? Dana Anspach, in About.com, writes a very brief article—“What is a Fee-only Financial Advisor vs. a Fee Based FA?” explains the difference as no commission vs. commission.